Catherine Drabkin is a painter, printmaker and educator. She received her BFA from the Maryland Institute/College of Art and her MFA from Queens College/Cuny. She has exhibited work both nationally and internationally and is included in numerous public and private collections in the United States and Europe. One of her recent projects: Finding Home: an American Neighborhood, is an artist's book inspired by her neighborhood in downtown Wilmington. 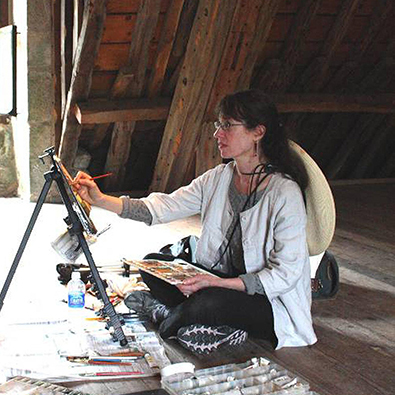 It received supported by an Opportunity Grant from the Delaware Division of the Arts. An interview on WILM radio with Paul Weigraff Director, Delaware Divison of the Arts and Guillermina Gonzalez on November 3 is available through the DDOA website at http://www.artsdel.org/podcasts/131103_de_state_of_arts.mp3 She has been represented by Kraushaar Galleries in New York since 1994, were she will have her seventh solo exhibition When Lilacs Last in the Dooryard Bloom'd in October, 2014. She has recently had solo exhibitions at Art Space Harrisburg Area Community College, Lancaster, PA, Blue Streak Gallery, Wilmington, DE and the Madeline Cohen Gallery, Community College of Philadelphia which traveled to the Blair Gallery, Hoyt Arts Center in New Castle, Pennsylvania. A founding faculty of the Delaware College of Art and Design, she has also taught at the University of Nebraska/Omaha, Southern Connecticut State University, Dartmouth College Point Park University, and Seton Hill University. Her work will be included in Villes de Bretagne, Patrimoine et Histoire edited by Les Presses Universitaires de Rennes in 2015. 1982, Maryland Institute/College of Art: B.F.A.